The #Pulse Shooting: Can Educating the Public Keep LGBTQ Youths Safe? 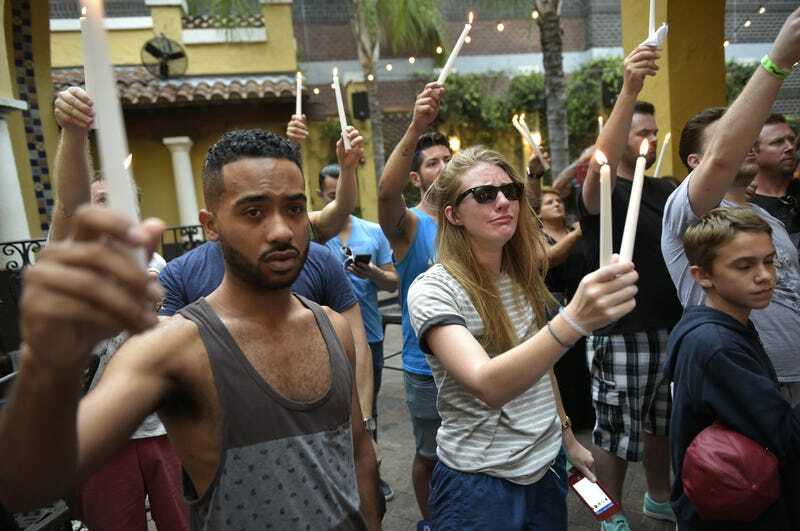 People hold candles during a vigil at the Ember restaurant and bar in Orlando, Fla., on June 12, 2016, for the victims of the Pulse club shooting in Orlando. It is eerily prescient that just two days before Sunday’s terror attack at Pulse nightclub—a popular spot for the LGBTQ community in Orlando, Fla.—black lesbian, gay, bisexual, transgender, sexually questioning and queer young adults gathered in Washington, D.C., for the first Summit on African American LGBTQ Youth. In light of the horrifying attack, the urgency of protecting them has never been more clear. The youths who attended that summit had to have shuddered with feelings of vulnerability upon learning that a gunman, identified as Omar Mateen, 29, executed 49 people and injured an estimated 53 more. That’s because the Orlando attack was not only the worst mass shooting in U.S. history but was also a reminder to the LBGTQ community of their artificial relationship to security. After all, what if the summit had been targeted? While I am a stark advocate for gun control, I also know that our lust for guns is related to our hate of minority groups. Whether we blame access to assault weapons or Islamic extremists, we can never forget that ignorance fuels the hatred and bigotry that is killing our LGBTQ neighbors, friends and loved ones. Education is the highest and most durable form of protection. And LBGTQ youths and their loved ones have every reason to be terrified because states and districts have not appropriately addressed their existence in curricula or in harassment policies. The Summit on African American LGBTQ Youth resonates because each multiple identity is a mark. Sexual identity is obviously besieged. Driving, shopping and walking while black can get you arrested or killed. Being a woman puts you under attack. Being a young black male puts you at risk. And our youths are wrestling with all of these threats. Texas Lt. Gov. Dan Patrick, who strongly rebuffed President Obama’s directive to public school officials to permit transgender students to use the restrooms and locker rooms corresponding to their gender identity, sent out a "reap what you sow" tweet only hours after the mass shooting. He later claimed that the tweet was not in response to the terrorist attack at Pulse and removed it amid the backlash, but one can’t so easily delete the attitudes behind the tweet. And if we are honest, Patrick is right. We are reaping the constant planting of hate. Patrick sowed hate with his aggressive policy stance against transgender students. He planted hate with his petty, ugly tweet. Worse is the dearth of attentiveness to the histories of gays, blacks, women and other minority groups. Our indifference and, in some cases, hostilities that are reflected in our schooling policies form the violence against marginalized citizens. Those who don’t subscribe to GOP presidential nominee Donald Trump’s dog-whistle language of wanting to “make America great again” have no choice but to embrace the vulnerability created by hate. We are ostensibly targets, but we are not alone. We must stand in solidarity with our LGBTQ neighbors. That standing starts in school so that we can reap what we sow. This story was produced by the Hechinger Report, a nonprofit, independent news organization focused on inequality and innovation in education, in a partnership with The Root.